This year I went a bit wild with buying seeds, plants, and bulbs. After ten years in NYC I was so excited to have a yard to work in, and seed catalogues had such interesting things to try! I’m not a great gardener, so many of my interesting little plants didn’t make it or did poorly, but I’m learning. We’ll see how my attempt with fancy tulips goes next spring when the village deer attack, but this fall I have something rather incredible growing. It never occurred to me to grow the famously expensive spice. 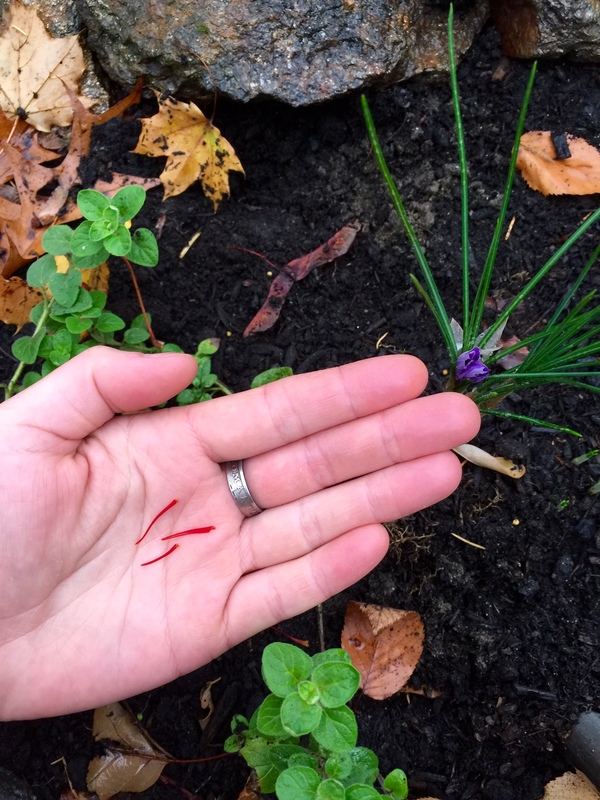 Saffron was always a very foreign thing, and I had no idea that it was from a plant that could be grown in north America let alone New York state. One day this summer I was tempted by an email from Breck’s, and I ended up poking around the site for bulbs to order. I happened to see saffron crocuses on offer, and amazingly they were said to be suited to my zone. The price wasn’t bad, and I didn’t hesitate for a moment in placing an order. Of course they didn’t arrive until it was time to plant them, which I think was the end of September? It wasn’t easy deciding where to plant them, and at first I tucked them into the herb tubs, but a few days later I created a new herb bed around the back deck. It seemed like a much better, prettier, and more permanent place than the flowerpots I’d had on the patio all summer. 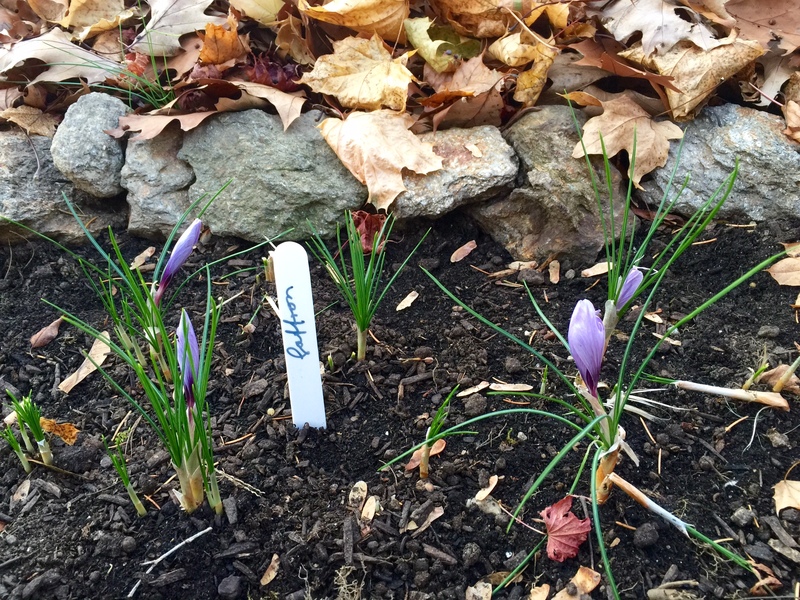 It also seemed like a better place for the saffron, so I carefully moved all the bulbs that I could find. (Squirrels had stolen a few.) Then… nothing happened for a while. I really didn’t believe they would ever grow. We’ve had a splendidly warm autumn, but our frost date was in the third week of October. By then a few tiny green sprigs had emerged, but how on earth could there be flowers yet? Google assured me that they could bloom in November, but I was very skeptical. The grassy green spikes sure grew well, but I saw nothing resembling a flower as the weeks passed. Slugs mowed down some of the nicest growth at the very base, which was unfortunate, and I began to give up on the saffron idea for 2015. Then overnight a bud unwrapped itself from a papery sheath, and I was able to harvest three threads! That was last week, and this morning there were several more pretty purple buds. Now it is a glorious and sunny day in the 60s, and those buds opened. Even after the remaining few bloom, and even if the others shoot up to flower, I’m not going to have much of the spice. The little glass jars at the store hold more, for sure, but I’m still so excited about it! I’ve read that they’ll spread well and produce more quickly, and I plan to order another set or two next year too. 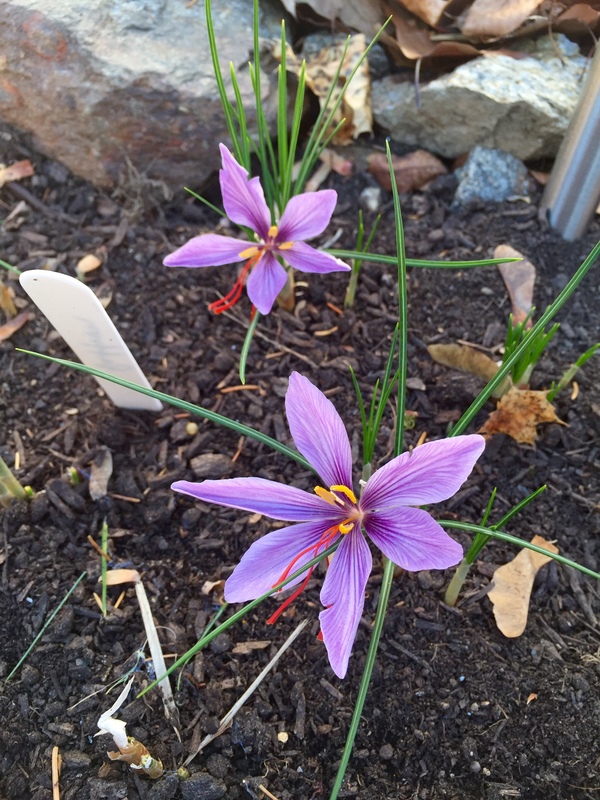 The funny thing is that I pretty much never even use saffron in my cooking, but the mid-November blooms are so cheerful that I’d want them for looks alone. All in all they make for a unique feeling garden!